Investigate rumors of a ghost that haunts the Karth River. Read Crypt of the Heart - Draft in the Silver-Blood Inn. Travel to the bridge next to Reachcliff Secret Entrance and follow the Ghost Knight to his grave. 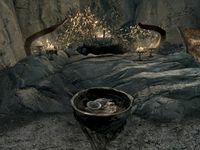 Defeat the Forsworn at the grave and read Forsworn Shaman's Note. Locate the Beldama Witches at Karthspire Camp and take the Corrupted Human Heart. Place the corrupted heart in the grave and defeat the knight's corrupted spirit in combat, then loot his grave for a set of Ebony Spell Knight Armor. Use the Shrine of Mara to cleanse the knight's heart, then return it to his grave to be given a set of Ebony Spell Knight Armor by the appeased spirit. This quest will automatically begin upon installing the Spell Knight Armor Creation. You will be directed to visit the Silver-Blood Inn in Markarth to seek out rumors that might have crossed the border from High Rock. Once at the inn, your quest marker will direct you to a guest room containing a book named Crypt of the Heart - Draft. Reading it will reveal the story of the Order of the Crypt, a knightly order from Shornhelm, and the tragic tale of a knight named Simon Rodayne who fell in love with (or was tricked by) a witch of the Beldama Wyrd named Daenella. Their relationship brought the order into conflict with the witches, driving the coven further and further east. It is said that Simon's ghost haunts the banks of the Karth River, below his hilltop tomb. 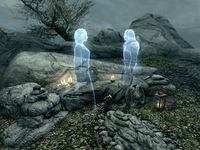 You will then be directed to investigate these ghost sightings by travelling to a bridge that crosses the Karth River just next to Reachcliff Secret Entrance. 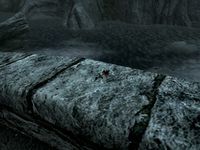 On this bridge, you will find a lone red mountain flower; when approached, a Ghost Knight will appear behind you and will wander off to the south, towards Dushnikh Yal. Follow the ghost as it makes its way up the slope. It will guide you to a grave west of Dushnikh Yal, which is surrounded by three hostile Forsworn. 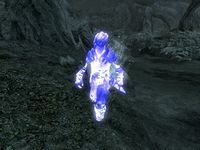 Kill the attackers and loot the Forsworn Shaman's body. She will be carrying a Forsworn Shaman's Note, which you must read to progress the quest. It reveals that the Beldama Wyrd has come to the Reach in search of Daenella in order to punish her for her betrayal. They have taken Simon's heart from his grave and have brought it to Karthspire Camp to defile it. 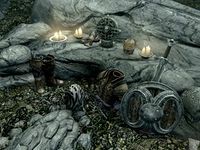 Surrounding the grave, you will find the bodies of two Knights of the Crypt who had been sent to the Reach to track down and kill the Beldama witches. If you wish, you can loot their bodies for a full set of Iron Spell Knight Armor and Steel Spell Knight Armor. Journey to Karthspire Camp and prepare for a fight; the campsite is swarming with Forsworn, and with this Creation installed you will have to deal with the added threat of Beldama Witches and a hagraven called the Beldama Ward Mother. They are located on the eastern side of the camp. Once you've subdued the many enemies at the campsite, approach the sacrificial altar where the Beldama witches are found. On it, you will find the corpse of Daenella, who had been captured by the witches and killed with the knowledge that the Ward Mother planned to corrupt her beloved's heart and return it to his grave tainted, damning his soul for eternity. Sure enough, you will find a Corrupted Human Heart on a pedestal in front of the altar. Take it and return to the knight's grave. Once you have the heart, you will be instructed to return it to the knight's grave, with the optional step of first purifying the heart of corruption. If you choose to place the corrupted heart within the grave, the corrupted spirit of Simon Rodayne will appear and attack you for damning his soul. He wields a bound sword in combat. Once you banish the ghost, you will be directed to loot his grave for a full set of Ebony Spell Knight Armor in order to complete the quest. If you instead wish to purify his heart, you must first activate the Shrine of Mara found at his tomb. Once this is done, place Simon Rodayne's Heart within his grave. This will cause a brief apparition of Simon and Daenella, finally reunited in death. The ghostly lovers will then disappear, and in their place a full set of Ebony Spell Knight Armor will materialize above the grave. Take the armor to complete the quest. Regardless of which option you choose, you will now be able to craft Spell Knight armor from iron, steel, and ebony at any forge, provided you have the necessary skill perks. The name of this quest (and the related book) is a reference to the Crypt of Hearts, which the Order of the Crypt is sworn to protect. This page was last modified on 18 March 2019, at 19:18.